Our fine composted mulch is made from woody materials that have been through the composting process, so potential for weed seed is eliminated. It is then ground finely to make an excellent ground cover around delicate plants in the garden or landscape. 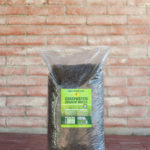 Perfect for flower and vegetable beds, or in pots for a decorative and effective mulch. Mulch conserves water and controls erosion while adding organic matter for good soil nutrition, and reduces evaporation. It keeps the soil cool in the summer, and warm in the winter.